Do you wonder how to increase your vocabulary? These vocabulary strategies can help you learn and remember new words. Different strategies work best for different people. 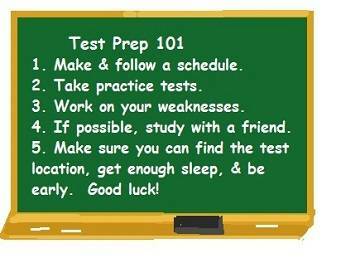 So try them all, then use the ones that work best for you every day to speed up your English learning. The best way to increase your English vocabulary is to read (or watch or listen to) some English every day. Try the news, articles, books, podcasts, or videos on a variety of subjects that interest you. When you see or hear words you don't know, use these strategies to figure them out, and to learn the ones that are important to understand what you're reading-- or that you see over and over. Use Context Clues. Try to guess the meaning of a new word from its context (the words around it.) See Improve (Your) Reading Skills for more information. Analyze word parts (roots and affixes.) Also see if any of its parts are like other words you know. Maybe you can figure out its meaning from similar words. If you know that spectators are people watching (looking at) an event, you might be able to guess that an inspector is someone who looks into things and watches to see that things are done properly. Start a vocabulary notebook. Try writing new words and their meanings in a vocabulary notebook or on a flash card. Write an example sentence too. If you can, add a drawing that reminds you of its meaning. Make a mental picture, rhyme, movement, or other clue to help you remember a word-- whatever works for you. 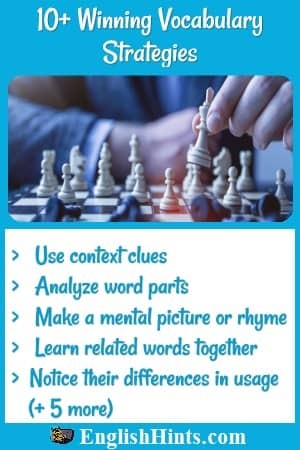 Connect it in your mind with related words you already know. Then review it-- often at first (at least once the same day), then less often once you know it fairly well. You can use flash cards for this (or spaced repetition software like Anki), or a vocabulary notebook or checklist. Keep your review sessions brief. A few minutes every day will help you learn much more than 2 hours once a week. Learn related words together. Although memorizing lists is a common vocabulary strategy, it's not an effective one by itself. However, learning related words as a group can be. Think about the words and how they are related, categorizing or grouping them and then sorting them by their relationships within the groups. Notice their differences in usage. (Talk, shout, scream, and whisper all use your voice to communicate, but some are louder than others. There are several good websites that offer a word a day, but I'm especially impressed by the New York Times' Learning Network's page. It chooses really useful words-- not just unusual ones-- and gives standard dictionary information like the meaning plus a recent quote from the New York Times that uses the word. A bonus-- the page lists more than a week's earlier entries in case you miss one. Try bookmarking it right now. You'll receive two issues a month, with interesting reading, review activities, and sometimes games, puzzles, or quizzes, to reinforce what you learn and make it yours! As mentioned above, the best way to learn new words is to read or hear them several times in context (not just study a list of words.) It takes a number of repetitions for most people to remember a new word and be able to use it. The main purpose of English Detective is to give you multiple opportunities to read, hear, and work with common academic vocabulary in interesting, real-life contexts. Are you worried about the TOEFL or IELTS exams-- especially about the reading or writing tests, and if you understand enough vocabulary to get the score you need? EnglishHints Academy has courses that may help you. There's more information here.